For the eleventh consecutive year, UBC Library and the Alma Mater Student Society are running their Food for Fines Campaign. 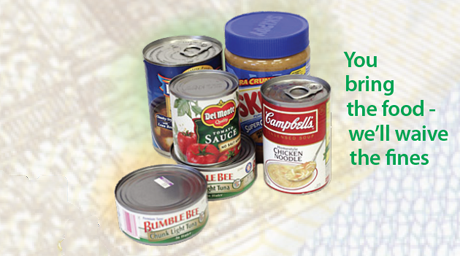 From October 21 to November 3, $2 will be waived for every non-perishable food item (up to a maximum of $30). Donations are also welcome! Food items are distributed to the Greater Vancouver Food Bank and the AMS Food Bank. Visit the AMS Food Bank site for a list of food items that are in high demand. Find us on Facebook & Twitter (#ubcfoodforfines). The Canadian Library Association has declared October 18 as Canadian Library Support Staff Day. It’s a day to recognize and give thanks to Library support staff who help deliver programs and services to their communities (and in our case, faculty and students). We believe that the contributions of all our Library staff are essential. If you’re dropping by any of our Library branches today, take some time to say thanks or high-five to your favorite Library staff – they’ll appreciate the recognition! Learn to use RefWorks citation management to organize your sources: PDFs, books, articles, web pages and more.